Cripsy Baked Chicken Nuggets, crispy, hot, sinfully tasty. And ready in just 30 minutes. 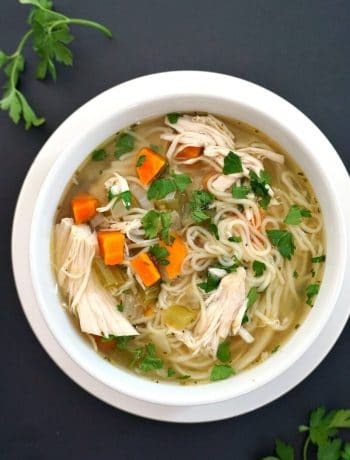 An easy recipe that goes well with the whole family. 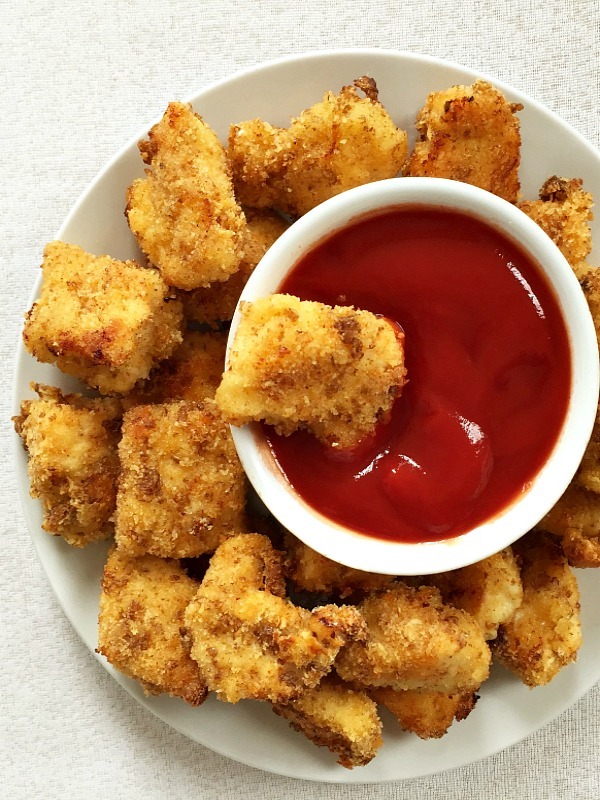 Chicken nuggets must be one of the most popular chicken recipes. And l can see why, they are some pretty bite-sized goodies that top the list when it comes to kids’ favourite recipes. Shame that most kids would only have the fast-food version, which l pretty much doubt has any real chicken in it. I mean, l do love a good rant, and l must have moaned many times before about how much l am against these fast-food restaurants. My ears hurt only when l hear words like McDonalds, KFC and the like. Come on, people, you can do better than that. I know that time is ever so precious, but fast food? Really? Rant over. For now. 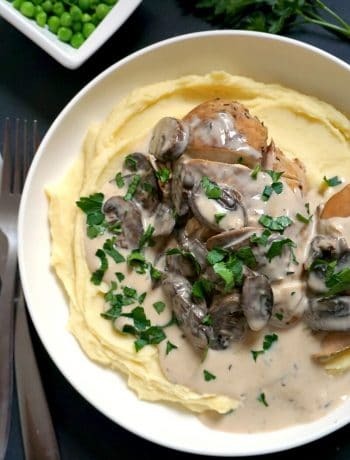 Cooking your favourite chicken recipes at home is a lot easier than you think. Tender Low-Carb Chicken Fritters Recipe , Baked Crusted Parmesan Chicken, Easy Crispy Oven Baked Chicken Wings are only some examples that homemade food is the best. How do you make crispy baked chicken nuggets? These are way healthier than any nuggets you will buy, no matter where from. Yes, you do use a tiny bit of oil to help them crisp up nicely. But that is pretty much it, no deep frying them in a oil that has been heated and re-heated and use for billions of chicken nuggets. If you don’t have weetabix (not quite sure it’s a thing in other countries outside the UK), you can use cornflakes. Crush the cornflakes and mix them up with the breadcrumbs, and that should do. drench the chicken pieces in flour first, shaking off the excess. Using a non-stick baking tray helps a lot, even though I still make sure it’s greased properly. In this way, I know that the chicken pieces won’t stick to the tray, and they will crisp up properly. How long do you bake the chicken nuggets for? Do keep an eye on them, but the nuggets should be ready in about 20-15 minutes if baked at 200 degrees Celsius (390 Fahrenheit). It’s a lot easier to make them than you thought. 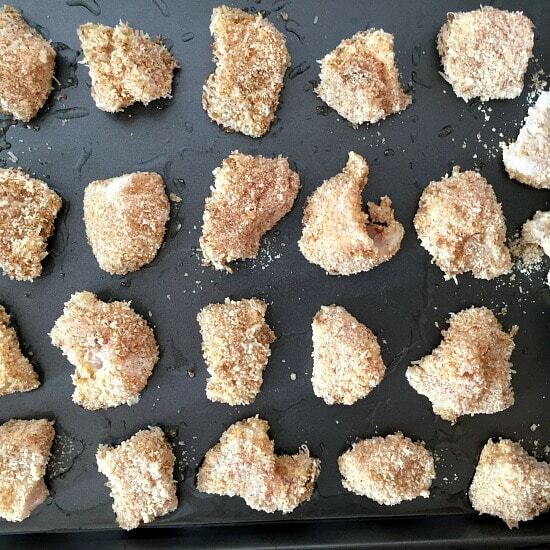 Just cut up the chicken in bite-size chunks, dip them in flour, shaking off any excess, then drench them in beaten egg, and coat with a nice breadcrumbs mixture. On the baking tray, drizzle some oil, in the oven, job done! 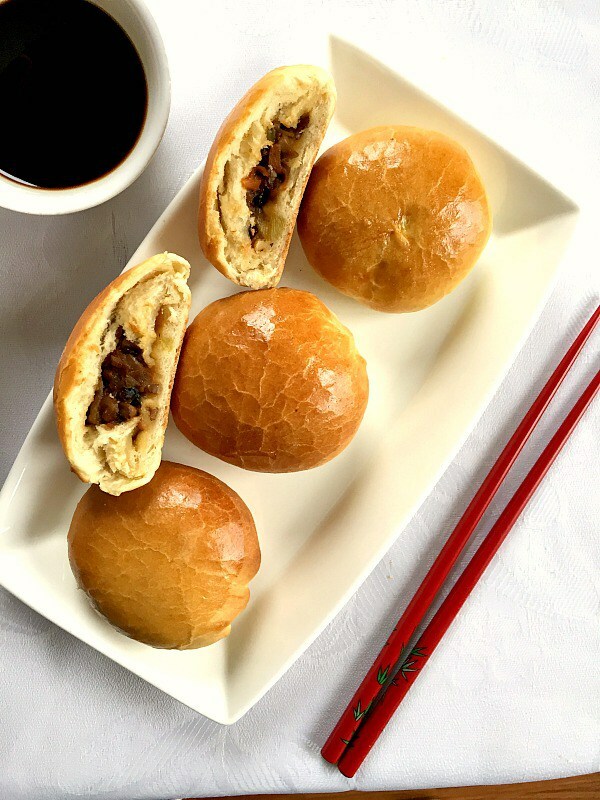 It’s so easy, even a complete beginner in the kitchen can successfully make them right on the first ever try. Serve them with ketchup, or any other sauce you like, and you are in for the best homemade treat. And whoever says healthy food is boring, give them something to think about! 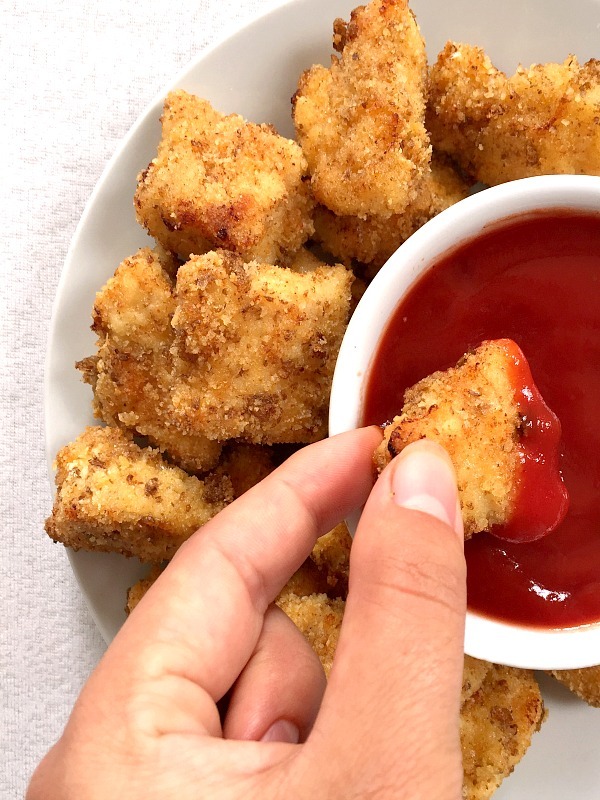 If you’ve liked my CRISPY BAKED CHICKEN NUGGETS or any other recipe on the blog then don’t forget to rate the recipe and let me know how you got on in the comments below, I love hearing from you! You can also FOLLOW ME on FACEBOOK, and PINTEREST to see more delicious food and what I’m getting up to. 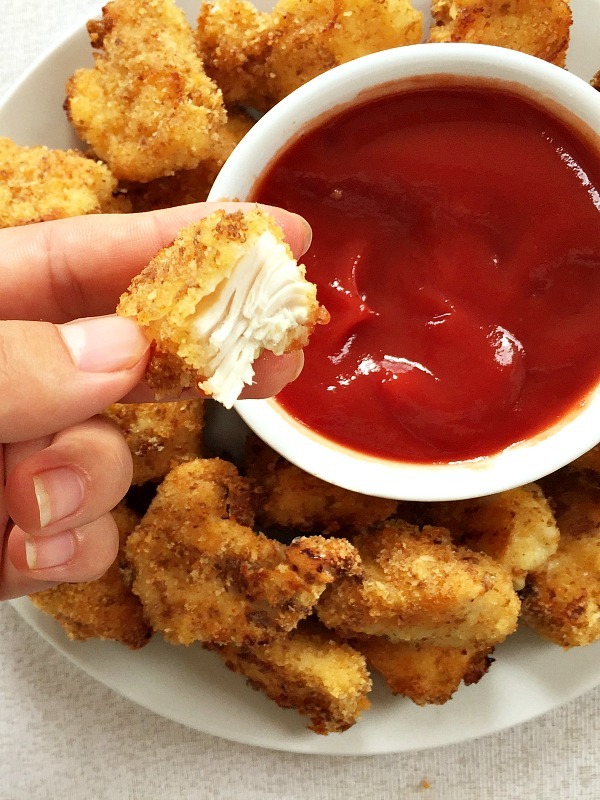 Crsipy Baked Chicken Nuggets, or the best ever homemade chicken nuggets. Crispy, hot, sinfully tasty. And ready in just 30 minutes. Preheat the oven to 200 degrees C (390 Fahrenheit). Dice the chicken breasts into bite-sized chunks. In a larger bowl, mix together the breadcrumbs, crushed weetabix, salt, pepper, garlic powder, paprika and parmesan. In a separate bowl, add the flour and have yet another bowl for the egg, which should be lightly beaten. Dip the chicken chunks in flour, then egg and then coat them well in the breadcrumbs mixture. 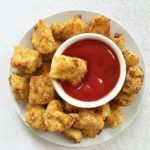 Drizzle 2 tablespoons of oil in a non-stick baking tray, arrange the chicken nuggets, drizzle some more oil on top and bake in the oven for about 20-25 minutes, turning them once half way through baking to ensure they are nice and crispy on both sides. Serve them with any sauce of your choice, my favourite is still the good old ketchup.